The Ohio Medicaid program is privatized. In 1978, roughly a decade after Medicaid was first created by Congress, Ohio contracted private corporations to assist it in managing Medicaid benefits for Ohioans. Today, these relationships represent some of the most significant sources of public expenditures, representing billions in taxpayer money both in Ohio and nationally. Enabled through a “Freedom of Choice” 1915(b) waiver with the federal government, it wasn’t until 2006 that managed care became mandatory, statewide, for the majority of enrollees which, as of today, number in the millions and include 90 percent of the total population enrolled. The operational environment of managed care in Ohio has undergone significant transformation since 2006 due to a geographic and benefit realignment from a 2012 contract bidding process, a steadily increasing focus on value and the addition of new populations. In February of this year, the Ohio Department of Medicaid announced it’s going to rebid the contracts with managed care organizations, which means the state may be able to renegotiate these relationships in ways that meet the expectations of Mike DeWine’s newly minted administration as the Governor establishes his priorities in health policy. Roughly a decade after Medicaid was first created by Congress, Ohio contracted private corporations to assist it in managing Medicaid benefits for Ohioans. The following Issue Brief examines Medicaid managed care in Ohio with a focus on the essential elements which currently define the program, the recent efforts to utilize contracting to advance value-based reimbursement, as well as some opportunities to innovate for the future. This brief will not address MyCare Ohio as the issues, conditions and populations between MyCare and Ohio’s traditional program differ greatly and thus this piece cannot adequately provide meaningful comparative analysis. Since the beginning of fiscal year 2012, Ohio has paid more than $61 billion to managed care organizations (MCOs). This figure represents nearly 3 out of every 4 dollars spent on Medicaid medical services during that timeframe. Looking at total program enrollment, 2.4 million of Ohio’s 2.9 million Medicaid enrollees are covered by one of Ohio’s Medicaid MCOs, though that number shrinks to 2.2 million, including the aged, blind and disabled (ABD), covered families and children (CFC) and the expansion population (Group VIII), once the MyCare population is excluded. As we have written about previously, there are cost differences between the three main categories highlighted in this brief (CFC, ABD, Group VIII). Generally speaking, the ABD group tends to need the most resources of the three as this population’s needs are the most significant due to the defining eligibility characteristic of having some disabling condition. Building on the 2006 mandatory enrollment requirement, a hallmark of the Kasich administration’s approach to governing Medicaid was utilizing managed care as a cost-containment strategy. Indeed, the former Medicaid Director in John Kasich’s administration, John McCarthy, highlighted the desire to have all populations in Ohio’s Medicaid program receive benefit administration through MCOs. He testified before Congress in favor of eliminating the waiver requirement for special needs populations. Since Medicaid is one of the most significant policy investments of the state, representing nearly 40 percent of all dollars appropriated in the biennial budget, the five MCOs act as the state’s proxy for stewardship of one in three dollars of Ohio’s budget. Given the increased role MCOs have had in managing these resources, the state’s contractual expectations for the plans can be examined to better understand the purpose and intention for this outsourcing. To understand managed care, it’s useful to comprehend what preceded it in fee for service (FFS). In FFS, which still covers 10 of the Medicaid population, the state reimburses services through a fee schedule (hence the name). The rates for each of these services are developed by the state agency in charge of the Medicaid program and those rates only have to be sufficient to ensure the state is meeting its obligation relative to the agreement it has with the federal government to draw down federal funds. Value, which can be described as the amount spent compared to the outcomes delivered, is harder to achieve. The difficulty in determining value in this process is because payment amounts to providers typically reflect the intensiveness of the service provided, not the outcome that is achieved. In other words, the more specialized and acute the intervention, the more that is reimbursed. The more specialized and acute the intervention, the more that is reimbursed. Of course, this model of payment has a simple, efficient logic to it. For example, a diabetes-related amputation is going to require more resources, equipment and expertise than it would to educate a patient who may be pre-diabetic. Intuitively, it would seem that the pre-diabetic consultation would be a “higher-value” to the state because of the downstream avoided costs. However, in a simplistic fee for service system, the state is not enabled to reimburse more for that value because the system must primarily ensure that individuals have access to the surgeon and the family medicine doctor, alike. For this reason, providers, as rational economic actors, have no natural incentive to structure their business models in ways that avoid the benefits of acute care reimbursement. Indeed, as the provider, it is much more economically advantageous to build one’s workforce and revenue cycle around that which provides the most reimbursement. This is not to suggest that the motivation of a provider is strictly financial or that the intention of the provider is to facilitate an amputation over that of a consultation, but it can be said the delivery system itself has been built around this model of payment and, as a nation and as a state, the amount of resources committed are not achieving the highest value results in terms of outcomes. Managed care in Medicaid is a delivery model concept where the government tries to couple flexible regulation around payment to providers with the abilities of private insurance companies to leverage data, coordinate care and negotiate price through contracting. On an ideological level, this model also allows for a private company to administer benefits instead of the government, thereby theoretically injecting market-based economic concepts into the program’s operation. In this scheme, rates are developed by an actuary, not by the state. Providers contract with an MCO and are reimbursed based on that contract. So, in that way, rates can either go up or go down depending on how the contract is established. There is also much more flexibility in design of these reimbursement arrangements via contracts, meaning MCOs are not limited to what would be an outsourced version of FFS, though they are required to provide all the same services that would be provided by the state through FFS. However, most contracts still rely on FFS as a fee schedule foundation, which has been shown to be preferred by providers. The majority of Medicaid MCO regulations exist in 42 CFR part 438. This brief takes a look at several elements within these regulations, starting with the standards around capitation rate development. As previously mentioned, the capitation rate development of MCOs differs from the state’s FFS rate development. First, capitation rates must be constructed in accordance with a standard known as actuarial soundness. This means that an independent actuary establishes the range of rates for all “reasonable, appropriate and attainable costs” required under the contract established by the state, though that does not prevent the MCO from contracting with providers at higher or lower amounts. Capitation is an upfront payment where the state pays the MCOs an amount based on the per-member per-month (PMPM) cost, which is the average expense associated with an enrollee during a given month as established by actuarial soundness. The state can offer a higher or lower budget range through the capitation, as a matter of policy choice, but it cannot deviate from what the actuary deems necessary. Ohio typically elects to select the lower budget range, called the “lower bound”, of this calculation. 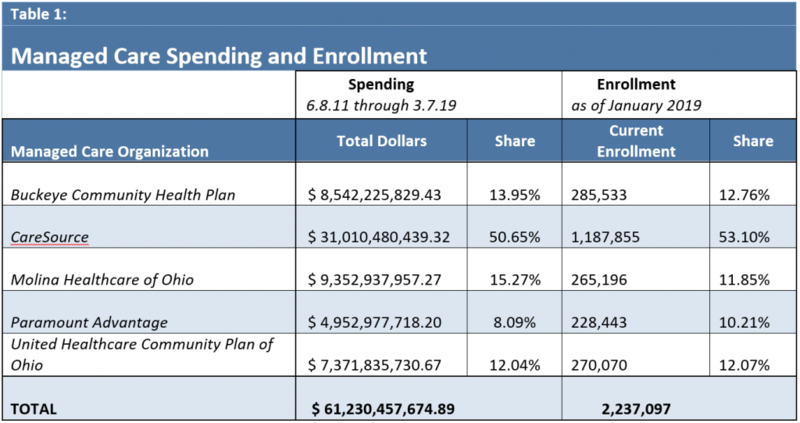 A number of factors go into this effort, including data on the population covered (age, types of enrollment), trends, non-benefit costs (like care coordination) and risk adjustment (meaning the projected likelihood of utilization of the population). The contract with the state contains within it the actuarial review as well as some trend information. Capitation is an upfront payment where the state pays the MCOs an amount based on the per-member per-month (PMPM) cost, which is the average expense associated with an enrollee during a given month as established by actuarial soundness. Capitation rates also have to reasonably achieve another standard known as the “medical loss ratio” (MLR). This is an important tool that will be discussed in the terminating section regarding value-based design, but the loss ratio signifies the amount of money that is spent on medical services versus that which is spent on administrative activities, including salary. By July 1, 2019, the beginning of the state’s fiscal year, rates will have to be developed so that a plan can “reasonably achieve” a MLR of 85 percent, meaning at least 85 cents from every dollar have to be spent on medical services. It can be argued that the main commercial tenet of a Medicaid managed care model stems from the state’s incentivization of controlled costs with the MCOs. The state pays the MCOs’ rates through a capitated payment. In a FFS model, this cost can be driven, in part, by how an individual utilizes services. If individuals use many higher cost services, this average amount will go up. In capitation, MCOs can keep a portion of the money they do not spend, meaning they have a natural economic incentive to keep costs down. For that reason, utilization management is the definitional activity of MCOs. Utilization management comes in many forms and has come under critical scrutiny by doctors and patients alike. First, it may be worthwhile to better clarify what the term utilization management means. According to the National Academy of Medicine, utilization management is “a set of techniques used by, or on behalf of, purchasers of health care benefits to manage health care costs by influencing patient care decision-making through case-by-case assessments of the appropriateness of care prior to its provision.” Perhaps the most familiar example of utilization management comes in the form of prior authorizations (PAs). PA is a requirement that the clinician seeking to deliver a good or service for a patient obtain approval from a payer (insurer) before that payer can reimburse the clinician. For example, if there is a particular medication that a physician prescribes, but a lower-cost, generic alternative exists, the MCO may require the physician to seek a prior authorization before the brand name drug is covered. As PA demonstrates, utilization management is a key function of MCOs as it enables the organizations to mitigate or intercede on the state’s behalf when it comes to controlling costs through controlling expenditures. This is, in theory, ensures the appropriateness of medically necessary services and medical/pharmaceutical items, but may create delays and surface questions about patient access and physician autonomy. If an FFS system encourages over-treatment, does a managed care system encourage under-treatment? First, Ohio Administrative Code 5160-26-03(A)(3) has established parameters around PA which prevents MCOs from having hard limits on services unless FFS has the same. Results documented in research on the effectiveness of Medicaid managed care in terms of cost, quality and access are varied. In a comprehensive 2012 study from the Robert Wood Johnson Foundation, research suggested that the impact of managed care in the aforementioned metrics were a mixed bag, depending on state. Costs may not have been reduced, although where there were savings, they were tied to utilization reductions because of managed care. Access was not reduced either, though evidence suggested that access increased for primary care and decreased for specialists under an MCO model. Additionally, any improvements in quality were indiscernible, in large part due to a lack of useful data. Importantly, it has been shown that quality outcomes, when compared to employer sponsored or Medicare advantage populations, tended to be lower in Medicaid managed care. This does, however, make sense due to the long-documented association between poverty and poor health outcomes, meaning Medicaid, as a means-tested program, is often faced with a population with more health risks. More on Ohio’s results on cost, access and quality will be covered in subsequent sections. Looking at survey information from MCOs nationally, the biggest challenges they have identified in access have to do with contracting specialists. This is, in part, due to the general shortages of specialists that exist, particularly in rural areas. For physicians, managed care has and continues to be seen as a barrier to care. In a recent survey conducted by the American Medical Association (AMA), 92 percent of doctors stated PA harms patients’ access. This underscores an important point about the economic conditions of healthcare as something in which consumers engage. Payers, whether that is the government or the MCO, are the consumers of healthcare. Individuals, i.e. patients, regardless of coverage type, do not directly purchase services nor are they equipped with the information necessary to be rational actors in this process. So, considering both the research and economic context, the effectiveness of a Medicaid managed care program must be judged by the policy interventions of the state, not of the individual patient, in achieving outcomes. To do this in a meaningful way requires an examination of Ohio’s current contract and the ways in which it has sought to achieve value through reimbursement design. The agreement that exists between the Ohio Department of Medicaid (ODM) and the managed care organizations is standardized and organized into several sections that address federal requirements as well as state expectations and mutual responsibilities in regard to data, benefits, payment and quality. This exhaustive 257 page document has 17 appendices, but just a few items will be discussed in this brief. As independent contractors with the state, MCOs are bound to disclose information and data to the state, upon request, as long as the state does not share proprietary information. As independent contractors with the state, MCOs are bound to disclose information and data to the state, upon request, as long as the state does not share proprietary information. The MCOs also use this contract, statewide, in the three regions established by the state. This is different than years past where different plans could operate in different regions. The MCO also has to have a certain executive organization, with expectations that it responds to state requests, adopts state policies and makes staff members available for meetings and events. In particular, plans must have a behavioral health administrative director who is licensed to deliver services in the state of Ohio. This is something that not only addresses the management needs of one of the highest cost populations in Medicaid (those with behavioral health needs), but also acts as a structural design response to the state’s efforts to have the behavioral health population enrolled in managed care, which happened in 2018. Interestingly, plans must also have similar administrative leads for early and periodic screening, diagnosis and treatment for children (EPSDT), quality improvement (QI) and community engagement (like connecting people to employment services). Building on the previous section regarding provider reimbursement, MCOs, unlike the state, are not limited to those services covered in FFS through the state plan. While the MCOs must notify the state of services they plan on offering in addition to FFS, they can alter services based on geography and identified member need. This flexibility allows plans to mitigate risks in paying for higher cost services by addressing other essential needs such as housing and transportation. In addition to this flexibility, there are some required notifications that plans must have with their members (e.g. pregnancy relates services) and providers (such as data regarding EPSDT). For some populations, the state is more prescriptive about what is required of plans, including during transitions of care between settings and services, which are historically known as inefficient points in the delivery system. This includes, but is not limited to, working with expectant mothers to coordinate care immediately upon discovery of a pregnancy, honoring previous prior authorizations for members, having region-specific family councils advise on MCO operations and coordinating with community behavioral health centers on care for members with significant behavioral health needs. MCOs also have the ability to offer feedback on individual providers regarding their performances on evidence-based guidelines and quality metrics, some of which is mandated. One example of this mandated provider interaction is tied to maternal mortality where the state requires additional payments to providers who convert 1 percent of Cesarean section rates to vaginal-based deliveries, which is a predictor in maternal and infant mortality. MCOs do not make clinical decisions about Cesarean sections and providers still provide the procedure when medically indicated. MCOs’ main source of data comes from claims, which represent information on those services for which they provided payment. Providers who contract with an MCO are considered to be on the MCO’s “panel.” Code of Federal Regulations (CFR) section 42 438.206 outlines what is required for these standards, with a focus on access. Claims data can be shared with contracted providers, but data, and reimbursement, may also be established with non-contracted providers if it allows patients to receive necessary services but does not always entail sharing discrete, outcome-related data. Regarding the panel, the state mandates that there be a certain number of primary care providers (PCP) so that total capacity for a single PCP is no more than 2000 members. The contract also requires contracts with other providers including hospitals, OB/GYNs, certified nurse midwives, certified nurse practitioners, vision, dental, behavioral health, pharmacies and other specialties as needed. The state ensures that this network of providers is meeting federal standards of adequacy and that enrollees are able to determine what providers are available. If an MCO fails to meet these standards, the state can impose sanctions. The remaining sections of the contract outline information relative to fraud, waste and abuse, financial performance (including the medical loss ratio) and quality. Regarding financial performance, plans must report on the amount of “clean claims” submitted by providers, with requirements that 90 percent of claims be paid within 30 days, and 99 percent of claims be paid within 90 days. In some respects, this measure can act as a proxy to determine if the utilization management efforts of an MCO are effective without compromising continuity of care. Indeed, the state publishes information on this performance metric and others quarterly, with data on hearings, appeals, PAs, clean claims and complaints. According to the most recently available report, the complaints tend to be concentrated on providers, particularly around issues of payment. It should be noted that plans were generally successful at processing claims within the state guidelines, with the average time ranging from 2.6 to 7.2 days. As this information has not been updated since the inclusion of behavioral health into managed care, this data will be important in evaluating how community-based behavioral health providers are faring under this system. Early signs did show struggles for some MCOs, particularly CareSource, although current data indicates improvements have been made. Not all evaluation of Ohio’s managed care system should revolve around the execution of the contract from a procedural standpoint. Comparison as the basis of performance enables an evaluator to understand achievement in a realistic, applicable context. In a service-based industry like health care, however, comparison can be difficult because of the amount variability and the depth of inputs that can affect the outcomes of any given service for any given individual. For this reason, managed care performance comes not only in the adjudicatory accuracy and efficiency of the MCO in question, it also comes in the MCO’s ability to make sure people are healthier and less likely to utilize services inefficiently. To this end, the population health model becomes the primary way health care is delivered by the state through its agreement with the plans and, consequently, the contracts between plans and providers. Population health has myriad definitions but, for this brief, population health will be defined by the health outcomes of a group of individuals, including the distribution of such outcomes within the group. As a payer the Ohio Department of Medicaid (ODM) is not singularly concerned with controlling costs. Since it is an entitlement designed as a public good effectuated through government, the role of the state is to balance the pressure to control costs with that of enabling service for eligible members of the public. To this end, ODM has established measures in its contract with managed care that try to create a basis of comparison, diminish the impact of chronic diseases on expenditures and account for the public health priorities of the state. Risk, in insurance terms, is the likelihood of an insured service taking place. Risk, in insurance terms, is the likelihood of an insured service taking place. For this reason, in the context of population health, there are individuals who are lower risk (less likely to receive a service) and higher risk (more likely to receive a service). This process of dividing a population based on risk is known as “stratification” and is a requirement of the plans. This stratification process must also include using a standardized risk assessment tool for the purposes of stratification within 90 days of enrollment. In addition to risk, populations must also be divided into “streams,” which reflect the public health orientation of the state. These four streams include women’s health, behavioral health, chronic conditions, healthy children and healthy adults. For each of these populations, the MCOs must outline specialized services and resources that align the stream with their associated level of risk. It is within this framework of population-aligned, risk-informed services that managed care has the highest potential for value creation. Included in these specialized services and resources are requirements for care management, risk assessment, individualized care plans, staff availability and identification, routine communication requirements, transitions and technology which documents all of these pieces. There are also requirements to work within specific projects of the state, including the Comprehensive Primary Care (CPC) initiative, behavioral health redesign, co-management of home and community-based waiver populations with waiver administrators, and case management of individuals leaving correctional facilities. Plans also must engage in activities which utilize statistically-based quality improvement science and engage in activities, as directed by the state, to address health disparities tied to social or economic disadvantage. To understand how MCOs act as agents of ODM in effectuating population health, it may be worthwhile to focus on CPC and behavioral health redesign as outlined in the contract as examples. CPC was one of the two main project endeavors of the Ohio State Innovation Model (SIM) project. Simply put, CPC tries to enhance physicians’ influence on patient outcomes by providing an alternative payment model to support care management, community connectivity, population risk-stratification with identification and tracking of the highest risk patients and team-based care, to name a few. A second aspect of the payment model includes the opportunity to participate in shared savings for practices who meet population and performance qualifications. In the context of CPC, MCOs are required to work directly with the practices that have signed up for the program. This includes information sharing, the identification of needs, common case management and data regarding attribution and utilization. Unlike other parts of the managed care program in Ohio, this requirement to commonly case manage populations is unique. A 2018 Health Affairs national review of the model did not show many meaningful results in terms of outcomes or costs, though other analysis suggests that the project needed time to mature and that physicians were generally more satisfied and thought the CPC initiative made their work more productive. It remains to be seen how this has played out in Ohio as much of the data surrounding this program is not regularly, publicly reported. In regard to behavioral health, the contract is explicit as CPC requires plans to partner with “Qualified Behavioral Health Entities” (QBHEs) to improve population health. It should be noted that this effort, known as Behavioral Health Care Coordination, is still being finalized as this paper is being published. With that said, the current requirements for this partnership contemplate coordinating with the primary care provider for the enrollee, participating in QBHE meetings as needed, notifying the QBHE of any critical transitions (such as admission to an emergency room), closing gaps in care and other social needs, and providing technical support to QBHEs around data use. Importantly, unlike CPC or other traditional medical environments, the MCO’s role is, in part, to build the administrative capacity for the QBHE in managing population health. While QBHEs have always played a role in case managing the needs of individuals with severe mental illness or substance use disorders, the community-based system has been disconnected from the traditional medical environment, and is also left out of electronic health record incentives and medical education payments for workforce development. To this end, MCOs play a role not only in assisting QBHEs with connecting case management functions between QBHEs and other providers, but also are intended to compensate for this lack of capacity through contractual mandate. ODM has developed a “report card” for managed care, ranking each of Ohio’s plans based on getting care, doctor’s communication and service, keeping kids healthy, living with illness and women’s health. While this two-page document may be a useful consumer tool in plan selection, it does little to explain exactly how plans perform relative to national benchmarks or to the state’s efforts to incent higher performance. It also doesn’t provide any information by region or illustrate performance relative to populations. While this two-page document may be a useful consumer tool in plan selection, it does little to explain exactly how plans perform relative to national benchmarks or to the state’s efforts to incent higher performance. The state, pursuant to federal law, must have an independent evaluator examine how MCOs are performing relative to quality benchmarks but also develop individualized data around utilization, encounters, patient experience and case management. Regarding paying for quality specifically, Ohio created a “Pay for Performance” program (P4P) which has evolved over several years. P4P relies on using a common set of measures established by the National Center for Quality Assurance (NCQA) known as the Healthcare Effectiveness Data and Information Set (HEDIS). The Agency for Healthcare Research and Quality (AHRQ) is also the source for the Consumer Assessment of Healthcare Providers and Systems (CAHPS), which evaluates patients’ perceptions of the care they receive. A look into the state’s reports on performance around HEDIS, including those items outside of P4P, help to identify if the P4P policy is effective. The overall performance of MCOs relative to those P4P HEDIS measures went up and payment went up as well. As mentioned earlier, P4P is based on a sliding scale, where the minimum payment is made at the 25th percentile and the total bonus is earned once the 75th percentile is exceeded. For the six P4P measures, a low of 66.7 percent of MCOs exceeded the 25th percentile nationally in 2013, while 83.3 percent of MCOs exceeded the 25th percentile in the most recent year. Additionally, for the remaining 20 HEDIS measures tracked by the state, MCOs have increased performance above the 25th percentile from 73.9 percent to 85 percent. The state could increase or decrease the minimum and maximum percentiles for P4P. It should also be noted that these are relative measures, meaning the percentile is based on national comparisons for any given measure, not that of a true rate of completion (i.e. these are tied to a bell curve). As mentioned previously, the state contracts with an independent evaluator to determine quality achievement. The recent review was conducted by the Health Services Advisory Group (HSAG) who looked at the HEDIS and CAHPS information, evaluating the MCOs based on all the measures collected by the state, categorizing them into the four population streams highlighted earlier. This brief will not examine the CAHPS results of the MCOs as they are not tied to payment via P4P, but every plan was above the 25th percentile for all measures, with the most common rating being above the 90th percentile, indicating Ohio enrollees are generally satisfied with their plans and the associated contracted providers. The HEDIS measures and the P4P program seem to have had an effect on the population health management of the MCOs. However, as of April 2018, the P4P program as a bonus structure was sunset and a withhold arrangement, wherein up to 2 percent of the total capitation awarded to plans will have to be earned back through the achievement of quality, was installed. For those dollars that are not earned, a bonus pool is available to those plans which achieve above the 75th percentile. As opposed to the previous P4P program, the quality measures in state fiscal years 2020 and 2021 will be tied to cardiovascular disease, diabetes, behavioral health and healthy children. This is outlined in the Quality Indices and Scoring Methodology established between the MCOs and the state. This program includes the use of HEDIS, like the rest of P4P, but has a complex calculation that includes weighted scoring tied to a number of measures linked with each of the four quality measure areas. This calculation determines a final “index score” which then is used to determine the amount of “the withhold” that is remitted back to the MCO. As with the state’s contract, generally, these measures can be changed, augmented and revised. This is, in part, to accommodate the state’s focus on moving reimbursement to a population-focus as opposed to any single measure as active management is required more so than the achievement of any single measure. In sum, managed care is an agent of the state’s efforts in the State Innovation Model through CPC and is responsible for carrying out the population health management priorities established by ODM through the P4P program. Since 2013, ODM has built upon its initial contractual arrangement to tie more dollars to value and prescribe greater attention be paid to high-risk, high-cost Medicaid enrollees as well as performance improvement projects based on historical performance. Beyond specifics, the state’s contract with MCOs includes a provision where at least 50 percent of all aggregate payments to providers through MCOs be value-oriented or face sanctions, creating an incentive for plans to contract more effectively, in a general way. With 2020 fast approaching, and the current rebidding process underway, existing plans’ effectiveness during this contractual cycle may be a worthwhile policy to maintain. In February 2019, the Ohio Association of Health Plans (OAHP), which represents the existing managed care organizations in Ohio, issued a report highlighting the advantages of MCOs relative to traditional FFS. OAHP claimed quality vastly improved. Additionally, working with the actuary Wakely, OAHP claimed costs relative to FFS were billions less each year. While it may be worthwhile for the state’s actuary to review the validity of these costs claims, as the FFS projections are based in historical trends that are agnostic to delivery system improvements (electronic health records, for example), the general argument seems to be accurate. 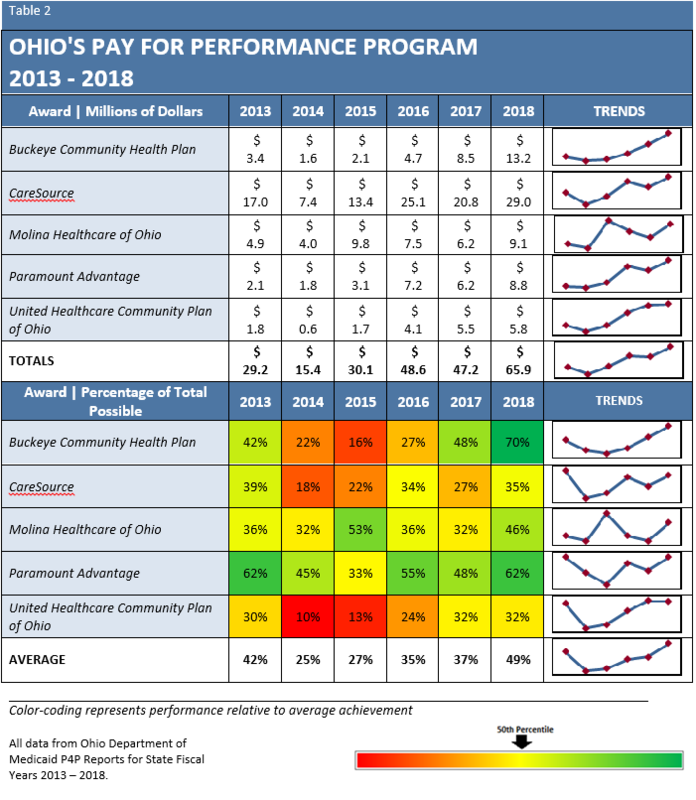 In the aggregate, costs across MCO regions in Ohio has gone down year to year and the comparative performance in HEDIS and CAHPS has gone up, though the results in HEDIS are currently minimal for the majority of indicators. As the state of Ohio’s recent deliberation over Pharmacy Benefit Managers reveals, the government has to play a strong role in ensuring these contracted entities are held accountable in achieving the triple aim of better access and improved care at lower costs. This recent, Ohio-specific example is not the only challenge, however. A 2018 report from the U.S. Department of Health and Human Services’ Inspector General’s office recently said a third of all managed care insurers reported fewer than 10 cases of suspected fraud or abuse to state officials. In some cases, insurers did not even report the termination of contracts. Given the high-level of concern from providers about payment, it makes sense that the dueling pressures of timely payment and adequate fraud protection require some level of contractual and procedural contemplation by the state. What’s more, it underscores the need for flexibility in designing these programs on the administrative level if only because statute or legislative mandate does not appropriately allow for the thoughtful execution of contract administration in a dynamic delivery system replete with varied, agenda-driven stakeholders. To that end, there are some considerations the Ohio Department of Medicaid could take into account as it revisits its contract with MCOs through the rebidding process. Given the high-level of concern from providers about payment, it makes sense that the dueling pressures of timely payment and adequate fraud protection require some level of contractual and procedural contemplation by the state. According to national research, it takes an average of 17 years before evidence makes it into clinical practice. In this research, the authors suggest that some of the issues stem from the overwhelming volume of research and the diffusion of priorities and responsibilities in implementation. In other words, the process of implementing the best medicine possible is not always consistently and standardly communicated with clinicians, therefore leading the system to be defined by fragmentation. In the context of Ohio Medicaid, many of the efforts over the last few years can be seen through the introduction of standardized, value-based concepts into clinical workflows. HEDIS, CAHPS, P4P, SIM, etc., are all programmatic installations of value-based design. According to the data that is available, these efforts are having a positive impact on cost and quality, but not as much as they could. The process of implementing the best medicine possible is not always consistently and standardly communicated with clinicians. Some of the current system may not be achieving its full potential because the arrangement of the delivery system information is asymmetric and asynchronous. Asymmetry is happening because the types of data that exist are disparate and not readily shared through a common tool in a broad way. Providers have clinical information in electronic health records which is often included in Ohio’s Health Information Exchange (HIE), CliniSync. An HIE, to explain, “…allows doctors, nurses, pharmacists, other health care providers and patients to appropriately access and securely share a patient’s vital medical information electronically—improving the speed, quality, safety and cost of patient care.” While this tool is accessed by more and more providers, there is no mandate to use it and community-level agencies and insurers do not have access. This means that the clinical information on any given patient is not always available to the person or persons responsible for delivering care. If some of the highest-value services come in the coordination beyond clinical spaces to non-clinical services, this is a significant continuity issue. Similarly, there is not an easily accessible way for providers to know their performance relative to the state’s objectives in HEDIS and cost and claims outside of CPC. In theory, a provider could reach out to an MCO or an MCO to a provider if there are gaps in care or if there are specific high-risk cases which need collaboration. That said, there is no formal systemic tool or protocol to do this, so there is no overt incentive. Key in this conversation is the problem of asynchronous information exchange wherein the data that is exchanged, whether it is clinical or claim-based, does not always happen in a real-time manner, meaning care decisions may not be circumspect. And while the CPC initiative promotes direct engagement between providers and payers, the state of Ohio could consider optimizing the specific case management engagement between the two groups for the highest risk populations. Put simply, if they are not sharing information, the state could make them. It will be worthwhile to see how the withheld arrangement compels MCOs to think differently about the ways in which they collaborate with providers. It will be worthwhile to see how the withheld arrangement compels MCOs to think differently about the ways in which they collaborate with providers. Perhaps this sort of tool can be equally shared with providers, allowing MCOs to automatically adjust their contracted rates with providers relative to measures tied to quality. In other words, MCOs and providers should share the penalty. Beyond this, the state could consider doing more to enable better information exchange between plans and providers. While Ohio has previously contemplated transparency laws, those were focused on patients, the least empowered actors in the commercial process of health care. While some may say that is the exact logic and thus the basis for such regulation, it has actually been shown to increase utilization and costs, which is the opposite of the desired effect. Still, if the state could facilitate a broader, standardized use of Ohio’s HIE and extend it to community-based organizations that may be a useful application of transparency to promote better market efficiency. Additionally, the state could develop a comprehensive, comparable all-payer claims database (APCD) or electronic clinical quality measures (eCQMs) which include medical claims, pharmacy claims, dental claims and eligibility and provider files collected from private and public payers. For example, Oklahoma has a system called “MyHealth” which links a web-based platform to which providers can connect to share medical records of patients and provide better transitional care with community organizations. The state could also geographically proliferate or encourage work through regional improvement collaboratives (RICs) which can act as a broker for this information and guide quality improvement efforts. This sort of integration, regardless of mechanism, has the potential to significantly reduce harm, waste and improve outcomes. Importantly, data on quality achievement, while publicly reported for payers, is not reported for providers in Medicaid. Even in the context of payers, it is confusing and technical. To that end, ODM should also consider hosting an online site where both elements of data are located in a media-friendly format that shows how Ohio’s providers are achieving quality, by provider. Ohio’s children are victims of lead exposure across the state, with concentrations in cities like Toledo and Cleveland. If Ohio continues the general structure of HEDIS, it should review which measures are included and to what degree they are achieved. For example, Ohio’s children are victims of lead exposure across the state, with concentrations in cities like Toledo and Cleveland. HEDIS has a lead screening measure and Ohio is currently underperforming in those screenings, though the Governor has cited lead prevention and screening as a priority. For public health crises like these, Ohio could make the P4P incentive or withhold more significant for a period of time to concentrate on the issue through that measure and consider tailoring any given measure to the needs of a given geography. What’s more, for those dollars that are not earned by the providers and plans, a non-GRF fund could be created or dollars could be allocated to provide resources for critical supports. In this example, money could be allocated to Ohio’s Housing Trust Fund, Ohio’s Lead Safe Fund or as state match in Ohio’s abatement program through the state children’s health insurance program (SCHIP) and should be designed as to not affect the JMOC rate given its potential to decrease costs, long-term. In 2018, The Center for Medicaid Policy with The Center for Community Solutions authored a number of briefs on social determinants and their impact on Medicaid. While a number of the interventions were outside of the program (increasing public transit funding as a way to address transportation issues for beneficiaries), a number were also possible through intentional Medicaid policy design. Many of these interventions, borrowing from other states, relied on the use of demonstration waivers to address these issues. Outside of waivers, though, there are policies the Ohio Department of Medicaid could consider as ways to increase accountability for plans and providers to address social determinants as a cost-saving measure. Example: California is considering a mandate that requires screens for Adverse Childhood Experiences be included in Early Periodic Screening Diagnosis and Treatment. Example: Ohio require a standardized social determinant screening tool in the required 90-day screening with a mandate to share information with the principal accountable provider of the patient. 2. Allow non-traditional services to count toward the medical loss ratio under the “in lieu of” standard. Example: Home visitation for a prenatal visit in lieu of an office visit. Example: Develop a metric on referrals to specific community-based services and tie to P4P. As was mentioned in an earlier section of this brief, MCOs have their rates risk-adjusted so that payment accounts for the potential intensiveness of need. In Massachusetts, the state added social determinants to this rate calculation process, creating a natural incentive for plans and providers to document these needs as they affect final reimbursement. This could be coupled with the opening up of the social determinant related “Z-codes” in ICD-10, which allow providers and non-physician providers to document patient needs such as housing, food and income in the medical record and thus, through HIE. If we know that a significant part of what creates downstream costs in Medicaid is tied to those issues that exist beyond the walls of a clinician’s office, we need providers and payers to account for these issues with the same gravity and imperative as any other diagnosed medical need. If we know that a significant part of what creates downstream costs in Medicaid is tied to those issues that exist beyond the walls of a clinician’s office, we need providers and payers to account for these issues with the same gravity and imperative as any other diagnosed medical need. Finally, Ohio could consider evolving beyond managed care into something wholly separate with accountable care organizations. Accountable care organizations are groups of doctors, hospitals and other providers who come together voluntarily to give coordinated care. Put another way, they are organizations which vertically integrate the coordination and data functions of insurance in exchange for direct reimbursement. Ohio already has this in Medicaid through its Partners for Kids (P4K) program which is a Pediatric Accountable Care (ACO) model in Ohio. Data from this program and others, nationally, show that this program was largely successful though there were “modest effects on quality and costs are consistent with recent reports from non-pediatric ACOs.” In the end, the improvements made were attributed to the advantages of scaling the care coordination across the entire ACO as opposed to within the specific practice or office. Interestingly, MCOs are still a part of the design of Ohio’s Pediatric ACOs and, in many states, that is a design feature that is often present. With ACOs, what the state would be doing is essentially opening up the market to new entrants. This could, in effect, allow for some innovative arrangement to come into the picture, though a few things should probably be kept in mind during design. For one, community organizations would have to be included. In some states, like North Carolina, ACOs must contract with community organizations and sub-contract the case management to these local organizations. If, for example, someone has an intense behavioral health need and they rely on services from that provider more regularly than they do their primary care physician or MCO, the behavioral health provider leads the case management efforts. Additionally, these arrangements must be full risk, especially for providers. The reality in American medicine is that price is what is driving up cost and providers (at least their employers) are responsible for this problem, not patients. If providers have access to an arrangement which essentially puts utilization control in their hands, they should face the full risk of exceeding their costs as an inherent duty of that power. Lastly, whatever the arrangement, it must put patients at the center of its design. Any organization operating as an ACO must be responsive to the needs of patients and patients should have decision-making authority in the organization. The reality in American medicine is that price is what is driving up cost and providers (at least their employers) are responsible for this problem, not patients. Whatever delivery model is enacted through policy, there are the commonly shared values of a better experience for patients and clinicians, lower costs and increased quality. Across all of these values, the United States is behind and Ohio is a laggard in the United States. Given the difficulty in transforming this complex system, particularly in a program with the depth and breadth of Medicaid, reforms, understandably, take time. It is with this in mind that an examination of the data is necessary and the data tells us we are, slowly, improving. While there are some successes to be had in the innovations over the last few years, more can be done particularly in the areas of social determinants and transparency. Contracts with managed care organizations, which receive billions of taxpayer dollars, should be designed in such a way that we maximize their value to create an efficient and effective delivery system. It is for this reason that, while the legislature should demand transparency from the Ohio Department of Medicaid, it should entrust ODM with the complicated, ever-evolving work that only an executive function could offer. If anything, the General Assembly would be well advised to transition its political focus away from individuals covered by Medicaid, who are not directly responsible for any expenditure, to the MCOs and providers that directly receive the $27 billion dollars Medicaid represents. If we know, empirically, that costs are the result of a combination of social determinants and price, then our system should be engineered to address social determinants and price. Managed care, with its ability to see across systems and case manage enrollees, may currently be in the best position, to navigate the non-clinical factors that affect outcomes. This management should be done in collaboration with, even at the direction of, community-based organizations that manage the most complex patients with the highest needs. Similarly, providers must be held to a higher standard of care which is simultaneously agnostic to the source of patient coverage while considering the ways in which their choices affect cost, particularly when patients are unable to address their most basic of needs. The Ohio Department of Medicaid, under the direction of Governor Mike DeWine, has an opportunity redefine Ohio as a high-value state for everyone, including the one in two children born into the United States enrolled in Medicaid. Through a careful examination of our options, a commitment to improvement and a bit of engineered collaboration, Ohio will achieve that goal. United States. The Ohio Department of Medicaid. The Ohio Department of Medicaid Managed Care Quality Strategy. Columbus, OH, 2018. https://medicaid.ohio.gov/Portals/0/Medicaid 101/QualityStrategy/Measures/MCQ-Strategy2018.pdf. MyCare Ohio is a demonstration waiver leveraging managed care to coordinate benefits of individuals simultaneously eligible for Medicaid and Medicare in certain counties. This is not a statewide program. “Ohio’s Interactive Budget.” Accessed March 8, 2019. http://interactivebudget.ohio.gov/default.aspx. Aly, Reem, JD, MHA, and Amy Bush Stevens, MSW, MPH. “2017 Health Value Dashboard.” July 2017. Accessed February 2019. https://www.healthpolicyohio.org/wp-content/uploads/2017/07/2017Dashboard_FullWithAppendix.pdf. Greene, Jan. “Fee for Service Is Dead. Long Live Fee for Service?” Managed Care Magazine. January 01, 2018. Accessed March 09, 2019. https://www.managedcaremag.com/archives/2017/9/fee-service-dead-long-live-fee-service. Kelley, Timothy. “Capitation: The Once and Future King.” Managed Care Magazine. December 15, 2017. Accessed March 09, 2019. https://www.managedcaremag.com/archives/2015/8/capitation-once-and-future-king. “Utilization Management: Introduction and Definitions.” Current Neurology and Neuroscience Reports. January 01, 1989. Accessed March 09, 2019. https://www.ncbi.nlm.nih.gov/books/NBK234995/. Sparer, Michael. “Medicaid Managed Care.” Robert Wood Johnson Foundation. December 01, 2017. Accessed March 09, 2019. https://www.rwjf.org/en/library/research/2012/09/medicaid-managed-care.html. Peek, Monica. “Poverty’s Association With Poor Health Outcomes and Health Disparities.” Health Affairs. October 30, 2014. Accessed March 27, 2019. https://www.healthaffairs.org/do/10.1377/hblog20141030.041986/full/. Muhlbacher, Axel, Volker Amelung, and Christin Jujnke. “Contract Design: The Problem of Information Asymmetry.” National Institutes of Health. March 2018. Accessed February 25, 2019. https://www.ncbi.nlm.nih.gov/pmc/articles/PMC5854223/. “The Ohio Department of Medicaid Ohio Medical Assistance Provider Agreement for Managed Care Plan.” Ohio Department of Medicaid. 2018. Accessed February 17, 2019. https://medicaid.ohio.gov/Portals/0/Providers/ProviderTypes/Managed Care/Provider Agreements/ManagedCare-PA-201902.pdf. Burton, Rachel. “Improving Care Transitions.” Health Affairs. September 13, 2012. Accessed March 10, 2019. https://www.healthaffairs.org/do/10.1377/hpb20120913.327236/full/. Kaplan, Emily Kumler. “Reducing Maternal Mortality.” The New York Times. March 05, 2019. Accessed March 10, 2019. https://www.nytimes.com/2019/03/05/well/family/reducing-maternal-mortality.html. “Q2 2018 Medicaid Managed Care Director’s Dashboard.” 2018. Accessed March 10, 2019. https://medicaid.ohio.gov/Portals/0/Resources/Reports/2018Q2-MMC.pdf. Bischoff, Laura A., and Kaitlin Schroeder. “CareSource Scrutinized over Late Payments as New Medicaid Work Arrives.” November 19, 2018. Accessed March 11, 2019. https://www.daytondailynews.com/news/caresource-scrutinized-over-late-payments-new-medicaid-work-arrives/4C6CXQVvnDwX65WYtCEk9I/. Kindig, David, PhD, MD, and Greg Stoddart, PhD. “The American Journal of Public Health (AJPH) from the American Public Health Association (APHA) Publications.” What Is Population Health? November 15, 2012. Accessed March 11, 2019. https://ajph.aphapublications.org/doi/10.2105/AJPH.93.3.380. Sessums, Laura, and Richard F. Shonk. “The Comprehensive Primary Care Initiative: Another Side Of The Story.” December 4, 2018. Accessed March 11, 2019. https://www.healthaffairs.org/do/10.1377/hblog20181130.132681/full/. “2018 Medicaid Managed Care Plans Report Card.” Accessed February 6, 2019. https://medicaid.ohio.gov/Portals/0/Resources/Reports/mcp-reportcard.pdf?ver=2017-09-19-073153-957. “HEDIS.” NCQA. Accessed March 11, 2019. https://www.ncqa.org/hedis/. “About CAHPS.” AHRQ–Agency for Healthcare Research and Quality: Advancing Excellence in Health Care. April 14, 2014. Accessed March 11, 2019. https://www.ahrq.gov/cahps/about-cahps/index.html. “2017 Ohio Medicaid Managed Care Program CAHPS® Member Experience Survey Executive Summary Report.” April 2018. Accessed February 15, 2019. https://medicaid.ohio.gov/Portals/0/Medicaid%20101/QualityStrategy/Measures/MCP-2017-CAHPS-Executive-Summary.pdf. “Quality Indices and Scoring Methodology.” 2018. Accessed January 22, 2019. https://medicaid.ohio.gov/Portals/0/Resources/Managed Care Reports/MethodsSpecs/2019/ODM-Quality-Indices-and-Scoring-Methodology.pdf. “Transforming Ohio Medicaid Through Managed Care: Driving Quality, Cost Savings and Innovation.” February 2019. Accessed February 2019. https://oahp.org/wp-content/uploads/2019/02/OAHP-Value-Report-02252019.pdf. Inserro, Allison. “Ohio Tells Medicaid PBMs That 2019 Will Be a Time for Transparent Contracts.” American Journal of Managed Care. August 15, 2018. Accessed March 12, 2019. https://www.ajmc.com/newsroom/ohio-tells-medicaid-pbms-that-2019-will-be-a-time-for-transparent-contracts. Terhune, Chad. “Insurers Fall Short In Catching And Reporting Medicaid Fraud, Inspectors Find.” Kaiser Health News. July 12, 2018. Accessed March 12, 2019. https://khn.org/news/insurers-fall-short-in-catching-and-reporting-medicaid-fraud-inspectors-find/. ​Balas EA, Boren SA. Managing clinical knowledge for health care improvement. In: Bemmel J, McCray AT, editors. Yearbook of Medical Informatics 2000: Patient-Centered Systems. Stuttgart, Germany: Schattauer Verlagsgesellschaft mbH; 2000:65-70. “What Is HIE?” HealthIT.gov. Accessed March 12, 2019. https://www.healthit.gov/topic/health-it-and-health-information-exchange-basics/what-hie. Volpp, Kevin G. “Price Transparency and Health Care Costs.” JAMA. May 03, 2016. Accessed March 12, 2019. https://jamanetwork.com/journals/jama/article-abstract/2518238. “All-Payer Claims Databases.” AHRQ. March 16, 2017. Accessed March 12, 2019. https://www.ahrq.gov/professionals/quality-patient-safety/quality-resources/apcd/index.html. Burkes, Paula. “IT Landscape Changing for Sharing Oklahoma Patient Medical Records.” Government Technology State & Local Articles – E.Republic. April 14, 2014. Accessed March 27, 2019. https://www.govtech.com/health/IT-Landscape-Changing-for-Sharing-Oklahoma-Patient-Medical-Records.html. Better Health Partnership: Our Measures. Accessed March 27, 2019. http://www.betterhealthpartnership.org/ourmeasures_detail.asp. Dissell, Rachel, and Brie Zeltner. “Cleveland Kids Still Poisoned by Lead at 4 times the National Average, State Data Shows.” Cleveland.com. March 21, 2018. Accessed March 12, 2019. https://www.cleveland.com/metro/2018/03/cleveland_kids_still_poisoned_by_lead_at_4_times_the_national_average_state_data_shows.html. Machledt, David. “Social Determinants of Health Medicaid Managed Care.” Social Determinants of Health Medicaid Managed Care. November 29, 2017. Accessed March 1, 2019. https://www.commonwealthfund.org/publications/issue-briefs/2017/nov/addressing-social-determinants-health-through-medicaid-managed. Barry-Jester, Anna Maria. “California Looks To Lead Nation In Unraveling Childhood Trauma.” Kaiser Health News. March 06, 2019. Accessed March 12, 2019. https://khn.org/news/california-looks-to-lead-nation-in-unraveling-childhood-trauma/. Ash, Arlene S., Eric O. Mick, Randall P. Ellis, Catarina I. Kiefe, Jeroan J. Allison, and Melissa A. Clark. “Social Determinants of Health in Managed Care Payment Formulas.” JAMA Internal Medicine. October 2017. Accessed March 12, 2019. https://www.ncbi.nlm.nih.gov/pubmed/28783811. Bresnick, Jennifer. “ICD-10 Allows Non-Physician Documentation of Social Determinants.” Health IT Analytics. June 13, 2018. Accessed March 12, 2019. https://healthitanalytics.com/news/icd-10-allows-non-physician-documentation-of-social-determinants. “Accountable Care Organizations (ACOs).” Centers for Medicare & Medicaid Services. March 08, 2019. Accessed March 12, 2019. https://www.cms.gov/Medicare/Medicare-Fee-for-Service-Payment/ACO/. Wallan, Sarah Wickline. “Pediatric ACO Succeeds in Ohio.” Medpage Today. February 09, 2015. Accessed March 12, 2019. https://www.medpagetoday.org/pediatrics/generalpediatrics/49929?vpass=1. Anderson, Gerard F., Peter Hussey, and Varduhi Petrosyan. “It’s Still The Prices, Stupid: Why The US Spends So Much On Health Care, And A Tribute To Uwe Reinhardt.” Health Affairs. January 2019. Accessed March 12, 2019. https://www.healthaffairs.org/doi/10.1377/hlthaff.2018.05144.